If your leather boots are too large, you may need to shrink them a bit to get a better fit. This is a guide about shrinking leather boots. I have seen different places on the web about shrinking leather by soaking it in water. Another place mentioned that the water will penetrate better by adding some alcohol to the water. Anyway, I'm afraid that if I soak only the top upper (or shaft) part of my boot that I want shrunk (because I have a large foot, but a small/thin calf and the top of the boot has a large gap around the calf area that looks ridiculous) that it might discolor and be a different color than the bottom (the boots are red). Anybody had any experience with shrinking colored leather like that and also how much shrinkage can I expect? Also it won't do me any good "wearing" the boot while it dries because it's not a matter of it conforming to my leg, I just want it to be smaller around (besides I don't think it will shrink enough to hug my leg anyway!). Just wondering how much it may shrink and if it will be worth taking the chance on messing up the colors (top vs. bottom of boot)? Thanks for any comments! You wont get much shrinkage that way. Consider finding someone who will restitch the boots for you to make them fit. I have done that sucessfully with english riding boots that are very expensive. Check with different shoemakers to find someone who will work on boots. In the Seattle area there is only one person who does it. If you know a motorcycle cop ask them as they have their boots taken in and let out as they gain or lose weight. There may be more people who can work on western boots. Good luck. I really don't think that wetting the top part of a boot will shrink it enough for your purposes - Have you thought about having them taken in by a shoemaker? Don't do it I've just messed up a pair of tiny lamas. Tiny llamas, lol! That I'd like to see. I just bought new leather boots online and the foot part is just slightly too roomy? Can I shrink just the foot and not the calf part? I doubt it. Leather stretches rather than shrinks. You might be able to wear heavier socks or put in a comfort insole. However, I think you should send them back and order the proper size. Google how to get cowboy boots to fit. I believe that they are thoroughly soaked with water, then worn until dry. This way, the leather will shrink as it dries and conform to your foot. I'd try just soaking the part you need to fit, and not too long - you don't want to ruin the boots. After dry, definitely waterproof them. Try half water and rubbing alcohol! The water will make the boot shrink and the alcohol helps to dry it faster! My leather boots are too big and keep slipping from the knee. Any suggestions on how I can shrink the leather so they stay put? Thanks for the information, it was very helpful! I took my new leather boots that were too big and soaked them in a bucket of plain water for abt. an hour. Then....put them on my feet and wore them all day. Somehow, they molded to my feet just perfectly. this was recommended to me by a friend who'd tried this before on the advice of someone else. And, although I was very dubious, thinking the water would RUIN my new ostrich quill, expensive boots, I tried it cause boots were 'slipping' so much on the heels.....and problem was solved. It's kinda cool how the boots mold to your very own foot shape. I have a pair of very expensive long leather boots. They are laced at the bottom and have a zipper. They are equestrian boots (just to let you know). The foot size fits snugly, but the calf size is just too big, about 5cm to big for my leg. Any help on how to shrink? 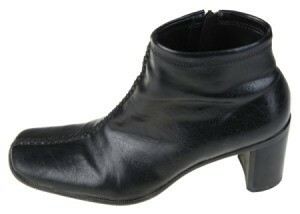 I would like to know if anyone knows how to shrink leather boots? Have you thought of just wearing thicker socks? They take up a lot of extra room. Try that and see if that helps. Soak them down from the inside with white vinegar and leave them somewhere quite WARM to dry. The vinegar makes the leather pliable, but it's the heat that shrinks them. Also, ill-fitting shoes can be "broken in" quickly by walking around in them for about 15-20 minutes wearing vinegar-soaked socks (or until they feel comfortable).